The Damascening is an artisanal technique which consists enchasing a wire of gold, silver or copper, on a metal surface, generally out of steel, in order to create a decorative motif. The result of this incrustation is called a damasquinure. This technique, very popular in Morocco, specially in Meknès. It is used for the decoration of the brackets and swords but also to decorate the dishes, the vases and the jewelry. This art of the incrustation is today a know-how in danger and Meknès is one of the last cities in the world where there is still some rare Master-craftsmen (maalems) who practice this profession. Custodian of this expertise, essaidi family excels in the creation and production of inlaid work, for several generations .As evidenced by the awards won by the family in national and international exhibitions. , since the 14th century,in Morocco by the Muslims and the Jews of Andalusia who come to take refuge there, under the growing threat of the Christians. 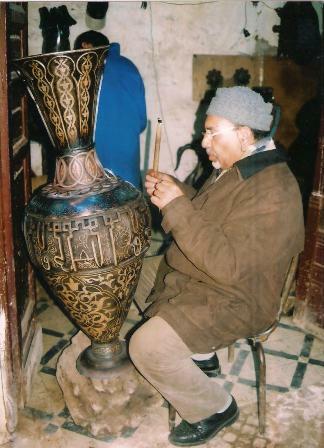 These craftsmen have played a major role in the transmission and the perpetuity of the damasquinerie from one continent to the other, a role that is currently still continuing in Meknes. . 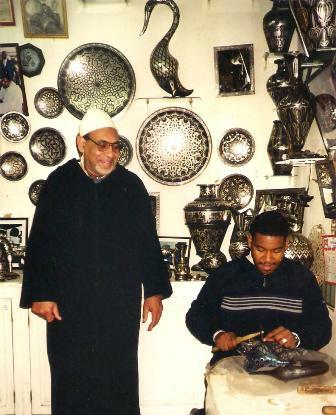 This art of inlay of metal in another , blossomed especially in Meknes where there are dozens of craftsmen.Meknes is one of the few cities in the world where this craft tend to continue. . . At the end of the nineteenth century,the Museum of Dar Jamaï in Meknes housed a school to learn this art, and it’s where we can contemplate damascinus objects of that period.